Population (2007 est. ): 4.4 million. Population growth rate (2007 est. ): 4.0%. Ethnic groups: Indian, Pakistani, Bangladeshi, Egyptian, Jordanian, Iranian, Filipino, other Arab; (15-20% of residents are U.A.E. citizens). Health: Life expectancy--about 76 yrs. Work force (2006) 2.968 million (93% foreign in 15-64 age group): Agriculture--2.3%; industry--61.9%; services--35.8%. Branches: Executive--7-member Supreme Council of Rulers, which elects president and vice president. Legislative--40-member Federal National Council (consultative only). Judicial--Islamic and secular courts. Administrative subdivisions: Seven largely self-governing city-states. Suffrage: State-nominated electors chose half of the Federal National Council seats in 2006. GDP (2006 est. ): $163 billion. Annual growth rate (2006 est. ): 9.7%. Per capita GDP (2006 est. ): $37,000. Inflation rate (2006 est. ): 10-13%. Agriculture (2005 est., 2.0% of GDP): Products--vegetables, dates, dairy products, poultry, fish. Foreign economic aid (2004): In excess of $5.25 billion. Only 15-20% of the total population of 4.4 million is U.A.E. citizens. The rest include significant numbers of other Arabs--Palestinians, Egyptians, Jordanians, Yemenis, Omanis--as well as many Indians, Pakistanis, Bangladeshis, Iranians, Afghans, Filipinos, and west Europeans. The majority of U.A.E. citizens are Sunni Muslims with a very small Shi'a minority. Many foreigners also are Muslim, although Hindus and Christians make up a portion of the U.A.E. 's foreign population. Educational standards among U.A.E. citizens population are rising rapidly. Citizens and temporary residents have taken advantage of facilities throughout the country. The UAE University in Al Ain had roughly 17,000 students in 2004. The Higher Colleges of Technology, a network of technical-vocational colleges, opened in 1989 with men's and women's campuses in each emirate. Zayed University for women opened in 1998 with campuses in Abu Dhabi and Dubai. Zayed University will establish separate male campuses for the 2007-2008 academic year. American University Sharjah had over 4,500 students enrolled in 2007. Many foreign universities, including ones from the U.S., U.K., and Australia, also have campuses in the U.A.E. The U.A.E. was formed from the group of tribally organized Arabian Peninsula Sheikhdoms along the southern coast of the Persian Gulf and the northwestern coast of the Gulf of Oman. This area was converted to Islam in the Seventh century; for centuries it was embroiled in dynastic disputes. It became known as the Pirate Coast as raiders based there harassed foreign shipping, although both European and Arab navies patrolled the area from the 17th century into the 19th century. Early British expeditions to protect the India trade from raiders at Ras al-Khaimah led to campaigns against that headquarters and other harbors along the coast in 1819. The next year, a general peace treaty was signed to which all the principal sheikhs of the coast adhered. Raids continued intermittently until 1835, when the sheikhs agreed not to engage in hostilities at sea. In 1853, they signed a treaty with the United Kingdom, under which the sheikhs (the "Trucial Sheikhdoms") agreed to a "perpetual maritime truce." It was enforced by the United Kingdom, and disputes among sheikhs were referred to the British for settlement. In 1955, the United Kingdom sided with Abu Dhabi in the latter's dispute with Saudi Arabia over the Buraimi Oasis and other territory to the south. 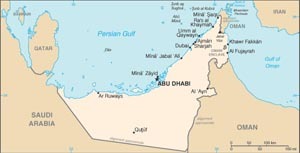 A 1974 agreement between Abu Dhabi and Saudi Arabia would have settled the Abu Dhabi-Saudi border dispute; however, the agreement has yet to be ratified by the U.A.E. Government. The border with Oman also remains officially unsettled, but the two governments agreed to delineate the border in May 1999. Since that time, the U.A.E. has constructed a border fence along the entire length with both Oman and Saudi Arabia. The new fence and checkpoints will likely be finished by 2008-2009. The U.A.E. sent forces to help liberate Kuwait during the 1990-91 Gulf War. U.A.E. troops have also participated in peacekeeping missions to Somalia, Lebanon, Bosnia, Albania, Kosovo, and Kuwait. In 2004, the U.A.E. 's first and only president until that time, Sheikh Zayed bin Sultan Al Nahyan, died. His eldest son Khalifa bin Zayed Al Nahyan succeeded him as Ruler of Abu Dhabi. In accordance with the Constitution, the U.A.E. 's Supreme Council of Rulers elected Khalifa bin Zayed Al Nahyan as U.A.E. Federal President. Mohammed bin Zayed al Nahyan succeeded Khalifa as Crown Prince of Abu Dhabi. In January 2006, Sheikh Makotum bin Rashid Al Maktoum, U.A.E. Vice President and Prime Minister and Ruler of Dubai, passed away and was replaced by his brother, Sheikh Mohammed bin Rashid Al Maktoum (MbR), Ruler of Dubai and U.A.E. Minister of Defense. On February 9, 2006, the U.A.E. announced a cabinet reshuffle. Several ministries were eliminated or renamed, while others were created. Administratively, the U.A.E. is a loose federation of seven emirates, each with its own ruler. The pace at which local government in each emirate evolves from traditional to modern is set primarily by the ruler. Under the provisional constitution of 1971, each emirate reserves considerable powers, including control over mineral rights (notably oil and gas) and revenues. In this milieu, federal powers have developed slowly. The constitution established the positions of President (Chief of State) and Vice President, each serving 5-year terms; a Council of Ministers, led by a Prime Minister (head of government); a supreme council of rulers; and a 40-member Federal National Council (FNC). The FNC is a consultative body with half its members appointed by the emirate rulers and half elected. The school system in Dubai does not differ from that of the United Arab Emirates. As of 2006, there are 88 public schools run by the Ministry of Education that serve Emiratis and expatriate Arabs as well as 132 private schools. The medium of instruction in public schools is Arabic with emphasis on English as a second language, while most of the private schools use English as their medium of instruction. Most private schools cater to one or more expatriate communities. Delhi Private School, Our Own English High School, the Dubai Modern High School, and The Indian High School, Dubai offer either a CBSE or an ICSE Indian syllabus. Similarly, there are also several reputable Pakistani schools offering FBISE curriculum for expatriate children. Dubai English Speaking School, Jumeirah Primary School, Jebel Ali Primary School, the Cambridge High School (or Cambridge International School), Jumeirah English Speaking School, King's School and the Horizon School all offer British primary education up to the age of eleven. Dubai British School, Dubai College, English College Dubai, Jumeirah College and St. Mary's Catholic High School are all British eleven-to-eighteen secondary schools which offer GCSE and A-Levels. Emirates International School provides full student education up to the age of 18, this is an International school and offers IGCSE and the IB program. Wellington International School, which caters education from 4-18, offers IGCSE and A-Levels. Deira International School also offers the IB program including the IGCSE program. The Ministry of Education of the United Arab Emirates is responsible for school's accreditation. The Dubai Education Council was established in July 2005 to develop the education sector in Dubai. The Knowledge and Human Development Authority (KHDA) was established in 2006 to develop education and human resource sectors in Dubai, and license educational institutes. Approximately 10% of the population has university or postgraduate degrees. Many expatriates tend to send their children back to their home country or to Western countries for university education and even to India for technology studies. However, a sizable number of foreign accredited universities have been set up in the city over the last ten years. Some of these universities include the Birla Institute of Technology and Science, Pilani (BITS Pilani), Heriot-Watt University Dubai, American University in Dubai (AUD), the American College of Dubai, SP Jain Center Of Management, University of Wollongong in Dubai and Institute of Management Technology, Dubai. In 2004, the Dubai School of Government in collaboration with Harvard University's John F. Kennedy School of Government and Harvard Medical School Dubai Center (HMSDC) were established in Dubai. Admission to any of these schools is based on the institutions respective policies. They differ in deadlines of submission of applications, admission procedures and tuition and matriculation fees. It is best to contact the school or institution to inquire about its own procedures. The U.A.E. has no political parties. The rulers hold power on the basis of their dynastic position and their legitimacy in a system of tribal consensus. Rapid modernization, enormous strides in education, and the influx of a large foreign population have changed the face of the society. In December 2006, the U.A.E. held its first-ever limited elections to select half the members of the FNC. Ballots were cast by electors selected by the emir of each emirate. One woman was elected to the FNC and seven additional women were appointed to be council members. The Trucial Oman Scouts, long the symbol of public order on the coast and commanded by British officers, were turned over to the U.A.E. as its defense forces in 1971. The U.A.E. armed forces, consisting of 48,800 troops, are headquartered in Abu Dhabi and are primarily responsible for the defense of the seven emirates. Although small in number, the U.A.E. armed forces are equipped with some of the most modern weapon systems, purchased from a variety of outside countries. The military has been reducing the number of foreign nationals in its ranks, and its officer corps is composed almost entirely of U.A.E. nationals. The U.A.E. air force has about 4,000 personnel. The Air Force has advanced U.S. F-16 BLOCK 60 multi-role fighter aircraft. Other equipment includes French Mirage 2000-9 fighters, British Hawk trainer aircraft, 36 transport aircraft and U.S. Apache and French Puma helicopters. The Air Defense Force is linked into a joint air defense system with the other six Gulf Cooperation Council (GCC) nations aimed at protecting the airspace of the allied states. The U.A.E. Navy is small--about 2,500 personnel--and maintains 12 well-equipped coastal patrol boats and 8 missile boats. Although primarily concerned with coastal defense, the Navy is constructing a six-unit class of blue water corvettes in conjunction with French shipbuilder CMN. The U.A.E. 's Land Forces are equipped with several hundred French LeClerc tanks and a similar number of Russian BMP-3 armored fighting vehicles. The U.A.E. Special Operations Command (SOC) is a small but effective force centered on the counter-terrorism mission within the country. SOC is well-financed, trained, and equipped and is capable of executing its mission with a level of expertise equal to, or above, the rest of the GCC. Prior to the first exports of oil in 1962, the U.A.E. economy was dominated by pearl production, fishing, agriculture, and herding. Since the rise of oil prices in 1973, however, petroleum has dominated the economy, accounting for most of its export earnings and providing significant opportunities for investment. The U.A.E. has huge proven oil reserves, estimated at 98.8 billion barrels in 2003, with gas reserves estimated at (212 trillion cubic feet); at present production rates, these supplies would last well over 150 years. In 2006, the U.A.E. produced about 2.8 million barrels of oil per day. Major increases in imports occurred in manufactured goods, machinery, and transportation equipment, which together accounted for 70% of total imports. Another important foreign exchange earner, the Abu Dhabi Investment Authority--which controls the investments of Abu Dhabi, the wealthiest emirate--manages an estimated $600 billion in overseas investments. In 2007, the U.A.E. pledged and delivered $300 million to Lebanon, and was the first country to fulfill its pledge. The U.A.E. has provided significant monetary and material support to the Iraqi Government, including a pledge of $215 million in economic and reconstruction assistance, and has also provided substantial aid to Afghanistan and the Palestinian Authority. The U.A.E. is a member of the following international organizations: UN and several of its specialized agencies (ICAO, ILO, UPU, WHO, WIPO); World Bank, International Monetary Fund (IMF), Arab League, Organization of the Islamic Conference, Organization of Petroleum Exporting Countries, Organization of Arab Petroleum Exporting Countries, and the Non-Aligned Movement. The United States has enjoyed friendly relations with the U.A.E. since 1971. Private commercial ties, especially in petroleum, have developed into friendly government-to-government ties which include security assistance. The breadth, depth, and quality of U.S.-U.A.E. relations increased dramatically as a result of the U.S.-led coalition's campaign to end the Iraqi occupation of Kuwait. In 2002, the U.S. and the U.A.E. launched a strategic partnership dialogue covering virtually every aspect of the relationship. The U.A.E. has been a key partner in the War on Terror. U.A.E. ports host more U.S. Navy ships than any port outside the U.S. The United States was the third country to establish formal diplomatic relations with the U.A.E. and has had an ambassador resident in the U.A.E. since 1974. U.S. Embassy mailing address--PO Box 4009, Abu Dhabi; tel: (971) (2) 414-2200, PAO (971)(2) 414-2410; fax: (971)(2) 414-2603; Commercial Office: (971)(2) 414-2304; fax: (971)(2) 414-2228; Consul General in Dubai--Paul Sutphin; PO Box 9343; tel: (971) (4) 311-6000; fax: (971)(4) 311-6166, Commercial Office: (971)(4) 311-6149). ENTRY/EXIT REQUIREMENTS: A passport is required. For stays of less than 60 days, U.S. citizens holding valid passports may obtain visitor visas at the port of entry for no fee. For a longer stay, a traveler must obtain a visa before arrival in the UAE. In addition, an AIDS test is required for work or residence permits; testing must be performed after arrival. A U.S. AIDS test is not accepted. For further information, travelers can contact the Embassy of the United Arab Emirates, 3522 International Court, NW, Washington, DC 20037, telephone (202) 243-2400. See our Fore ign Entry Requirements brochure for more information on the United Arab Emirates and other countries. Visit the web site of the UAE's Ministry of Information regarding tourism, business, and residence in the UAE at http://www.uaeinteract.org/. UAE authorities will confiscate any weapons, weapon parts, ammunition, body armor, handcuffs, and/or other military/police equipment transported to or through a civilian airport. Americans have been arrested and jailed for transporting such weapons and equipment without the express written authorization of the UAE government, even though airline and U.S. authorities allowed shipment on a US-originating flight. Information on vaccinations and other health precautions, such as safe food and water precautions and insect bite protection, may be obtained from the Centers for Disease Control and Prevention's hotline for international travelers at 1-877-FYI-TRIP (1-877-394-8747); fax 1-888-CDC-FAXX (1-888-232-3299), or via the CDC's Internet site at http://www.cdc.gov/travel. For information about outbreaks of infectious diseases abroad consult the World Health Organization's (WHO) web site at http://www.who.int/en. Further health information for travelers is available at http://www.who.int/ith.